Mountains has been an interesting studio to watch as their team has some serious industry street cred- Particularly with their involvement in both Monument Valley ($3.99) and Cuphead. Backed by Annapurna, it seemed like Mountains had the luxury to release anything they wanted. What they decided on was an interactive love story and after waiting what feels like an eternity, Florence ($2.99) is finally here. 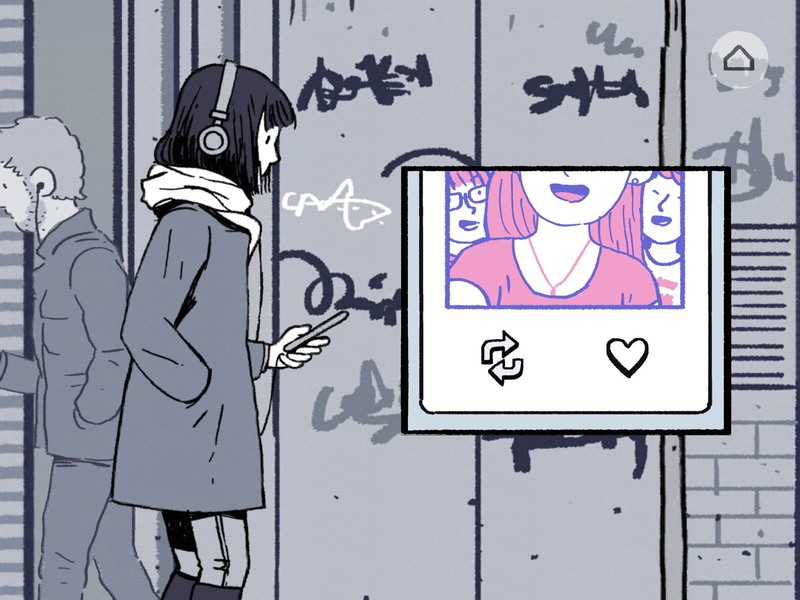 Florence is a tricky game to review, as it’s the sort of project that invokes all those annoying arguments surrounding what is and isn’t a game. (I’m not sure it’s possible to lose, it’s fairly difficult to not progress, and you can “beat" it in 30 minutes.) I think a better lens to examine Florence through is not as a game, but rather, as a really clever evolution of a visual novel. In that respect, Florence succeeds on a level that’s really just sort of absurd. The game, or visual novel, or interactive experience, or whatever we want to call Florence starts off with a day in the life of Florence, who lives a pretty boring adult life. It’s fascinating what a good job Florence does at driving home monotony, in fact, that’s really the magic of the whole thing- Through these individual micro-games Florence manages to flawlessly convey that emotion. For instance, one of the first things you do is wake up and brush your teeth. To wake up, you tap your alarm clock, snooze a bit, tap it again, then the game transitions to the bathroom where you’re rubbing the screen back and forth to fill up a bar for how long you need to brush your teeth. Not long after that you’re riding public transit on the way to work, and the game has you mindlessly liking and retweeting a faux-Instagram sort of thing. Then, at work, you play a number matching game as Florence does her accounting work. It seems intentionally dull, and does a great job of mirroring what it feels like when your days just sort of melt away doing the same monotonous things over and over. Eventually, Florence’s phone runs out of batteries, her music cuts out, and she hears something playing in the distance. It turns out to be Krish, who quickly becomes Florence’s new love interest. From there, it’s straight up weird how good of a job Florence does at capturing exactly what a new relationship feels like. 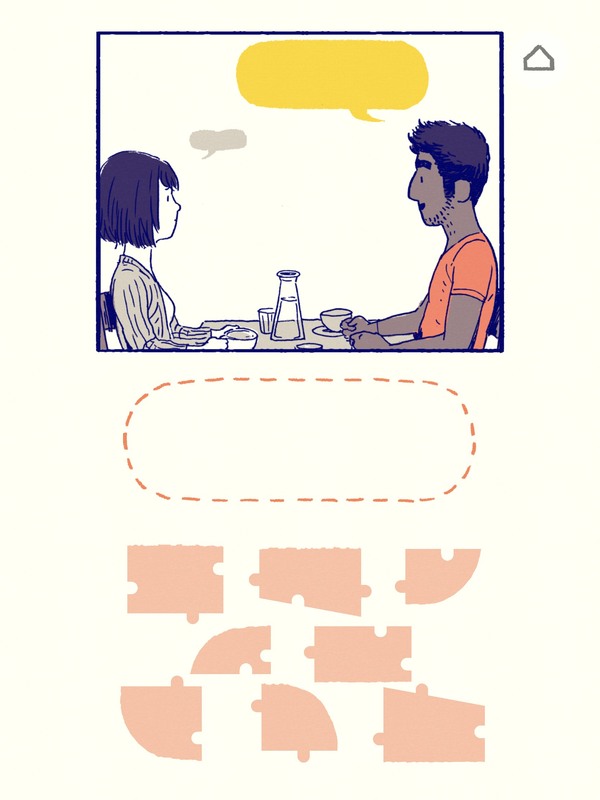 You go out on your first date with Krish, and to have your first conversation you’re putting together jigsaw puzzle pieces to form full speech bubbles. Initially these puzzles are complicated, with a bunch of pieces that you need to put together. As the date progresses, they get easier and easier until they’re not even a puzzle at all- Really mimicking what a great first date feels like, when by the end of the night everything is just easy and comfortable. Florence is a short experience. As mentioned, it took me about 30 minutes to play through it, so I really don’t want to spoil many more of the things you’ll do as interacting with these different set pieces is a big part of the whole thing. 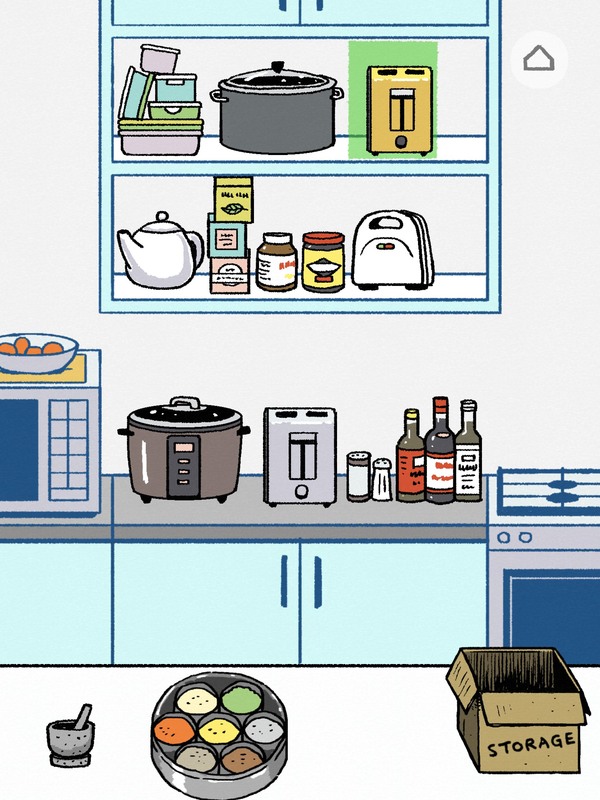 I’ll share my favorite moment though: When you eventually move in together, the game has you deciding where your stuff is going to go. The micro-game couldn’t be more basic, but the feelings it conjures of deciding what stuff comes out, what stuff gets put away, what might be important, what might not be, and whose things get put into storage to make room was so unbelievably spot on it’s eerie. That’s just sort of how Florence goes. I really like to avoid wishy washy conclusions in reviews, but Florence is a hard one. If you were waiting for Mountains to release the next Monument Valley gamer-y game, you should probably steer clear of Florence. You’ll blow through the game quickly, and likely be left with a “That’s it?" sort of reaction. Different strokes for different folks and all, but for me, Florence is going in the same mental folder as games like Reigns ($2.99) which I seem to just be constantly recommending to non-gamer friends of mine. Experience-centric games like That Dragon, Cancer ($4.99), Gone Home and others have found massive audiences of people who love the experimental side of gaming that focuses more on conveying emotions than they do high scores. If those are the sorts of things you’re into, chances are you’re going to wish Florence didn’t end so soon.